Buddy the Elf! What's your Favorite Color? I just like smiling. Smiling's my favorite! I figured I better not let my last post lead off this blog for long, just like I don't let the horrible parts of my work keep me down for long. 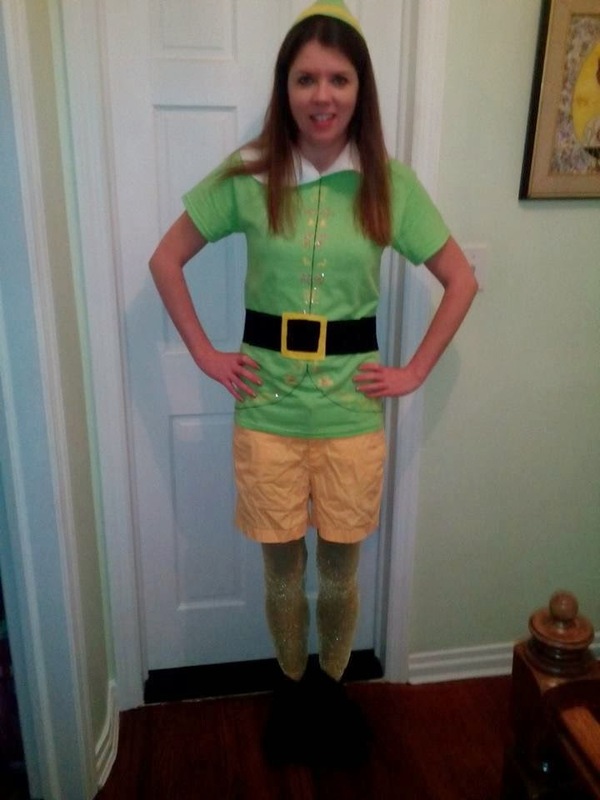 I'll switch gears completely and show you how I created my very own Buddy the Elf costume. We had Ugly Sweater day at school. I've made ugly sweaters before, including one that lit up! 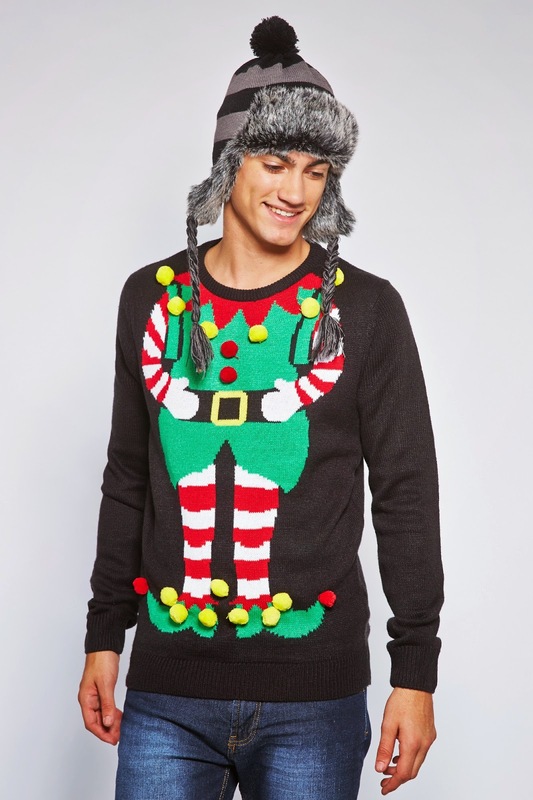 But, brainstorming out another hideous sweater, I came across the style that makes the wearer look like an elf. And then, elf on the brain, that turned into me recreating the hero of one of my favorite films, Elf. Everything about that film is right up my alley, from the North Pole aesthetic, to the innocent in the city, to the word "purply". It's perfect! 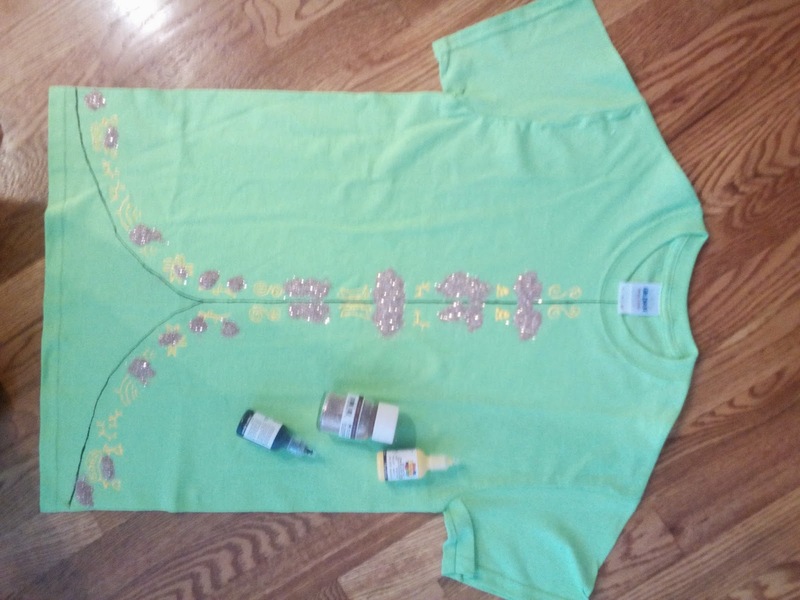 So, I bought one t-shirt, two rectangles of green felt, one each yellow and white, and 5 black. I already had black and yellow puffy fabric paint and gold glitter and tights, so this was far cheaper than my foray into Elsa territory. I started with the shirt, drawing a line down the center, then spreading each one out to the corners at the bottom to imitate the Nordic jacket Buddy wears exclusively. Then I drew Christmasy decorations around the placard, and glittered every other one. 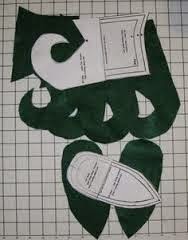 Because I thought originally I wear them the same way as the cotton headed ninny muggins, coat tails were a must, so I cut two rectangles from one sheet of green felt, and curved the outer edges, to cover my elfin tushie. I cut from the white felt two collar shaped pieces and whip stitched them to the neck line. 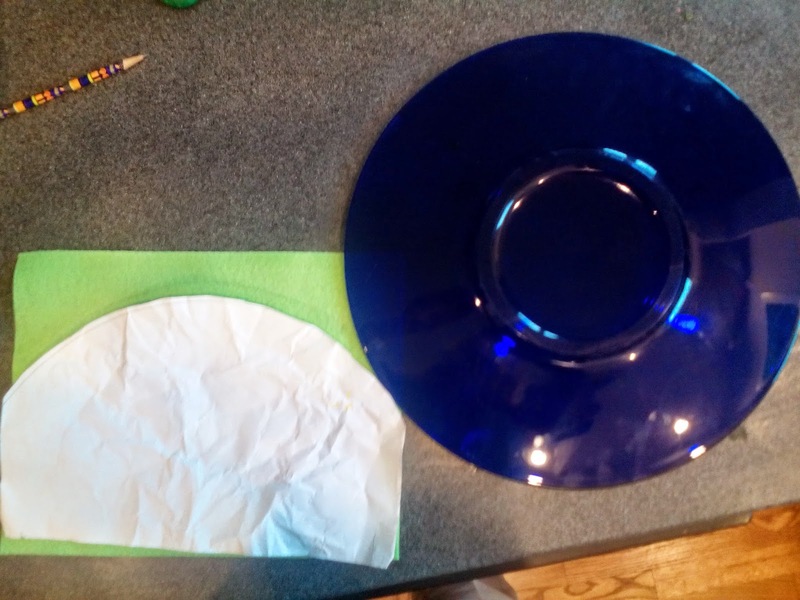 Traced a plate to create the cone hat. For the accessories, I cut a roundish shape from the remaining piece of green felt to make the hat. From the yellow, I cut out a band for the hat, and finished it with a white feather. Also from the yellow felt, I cut a belt buckle, and from one piece of black felt, I made a belt by cutting it lengthwise in thirds and whip stitching them together. That left the booties, my favorite part. I've always wanted to make shoes, for real, like Irish gillies or the kind that the insane folk at Ye Olde Renaissance Faire wear. I modified this pattern from About.com. I didn't make the bottom, I just placed the tops over my shoes. It happened that an 8 1/2 x 11" square of felt just fits a size 8 1/2 shoe when you cut out two pieces per foot! Happy coincidence. I whip stitched them together and placed them over my footwear and voila! In the end, I threw on a pair of yellow shorts, even though I put a pair of leggings underneath them. Can't be too safe from the easily offended (at least, by teachers, certainly not by each other, whose behavior is beyond reprehensible) population that I "serve". I'm a human, but I was raised by elves. The Truly Hard Way to Make a Living? Teach. Not that many read this blog, and that's okay. It's more for me, really. Today's post is one that, for my 15 regular readers, you may want to skip. It's therapy, and it's not pretty. teacher that is trying to improve you? 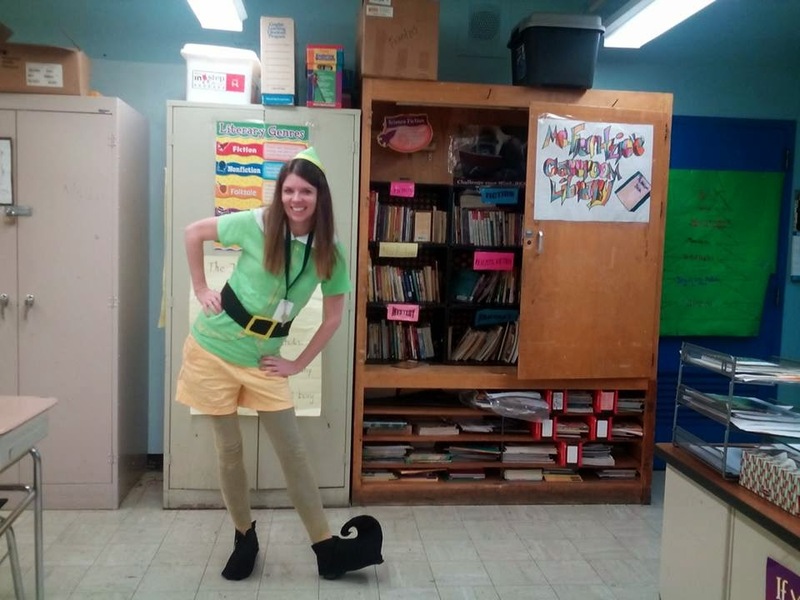 Many of my posts speak of the horrible indignities heaped on teachers these days. One of the worst has to be the accusations, almost always so ridiculous that, as a trusting innocent, one would assume would be laughed at by any reasonable adult, nay, child, even. However, that is not what happens in this day and age. No, no matter how unreasonable, how flimsy and beyond credible the charge, the teacher is treated like a common criminal. Now, this just may be part of the teaching downsides that needs to be tolerated by the good people who dedicate their lives to educating children. BUT, it is a threat to our very livelihoods, and, by extension, our families' livelihoods. I am now the sole provider for my little family, and if you don't like me, students, because I want you to learn, fine, but think of my child. She relies on me having a career. To say nothing about what it does to teacher's enthusiasm for their charges and their education. It is very difficult to get up and face your lying accusers and desire to better them. The morale of teachers is under attack from every angle, and having kids and their parents spread lies about professionals in order to, what exactly? Get a better grade? Not going to happen. Get another teacher? Not going to happen unless the teacher says "Forget it" and then you're looking at an inexperienced substitute who will barely have control over the class. What does this persecution even achieve? Because I have no idea. In any case, it saps the already trampled joy found when students grasp concepts that will improve their brains, their perseverance, and inevitably, their lives. So, yes, I'm currently under fire for accusations that don't hold up to logic, to scrutiny, or indeed to humanity. No matter that, of 90 students, only four will maintain the lie. No matter that the story has morphed and changed in attempts to make it stick. No matter that the four students making the claims are...well, I better think of my job. Still trying to hold onto it, for some unknown reason. (Actually, I know the reason. I had a much, much more lucrative career before this, that I enjoyed, but for the time off. But, it's looking better and better lately).